Sometimes all you need for a gorgeous wedding cake is a simple white cake topped with pretty flowers. It’s so simple and so pretty and I would love to see this at a summer wedding. 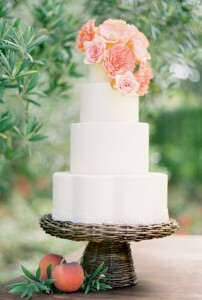 I love wedding cakes with fresh flowers – it’s such an easy and elegant way to add something special to your cake. And you can personalize it by incorporating the flowers from your bouquet or what your bridesmaids are carrying. This four-tier cake stands out with the bright white icing. And the lovely peach-colored roses and zinnias on the top give it just enough color to make it pop. I also love the addition of fresh peaches as extra decor. It really makes it a summer cake. You can find this cake here. It was designed by Sweet & Saucy.